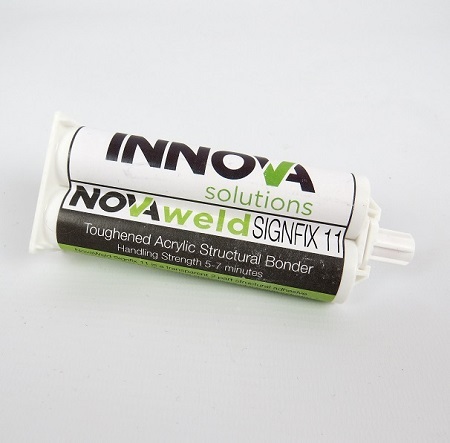 NovaWeld SignFix 11 is a two component structural methacrylate adhesive, designed for the bonding of high strength metal and composite applications. The adhesive has been formulated from innovative technology, including our revolutionary adhesion system. This unique system enables the SignFix 11 to achieve the ultimate balance of mechanical strength and impact resistance whilst still remaining both simple and quick to use single component low viscosity light activated structural acrylic adhesive designed to bond cast acrylic sheet with a bond strength that should always outperform the substrate. This ultra high strength is achieved by using a bespoke blend of advanced acrylic polymers that will cure on demand when exposed to visible light. Consult the SignFix material safety data sheet (MSDS) before using for the first time. Carry out surface preparation where required. Remove cap. Repeatedly press the gun trigger until both parts are dispensing before attaching mixer nozzle. This ensures you mix equal amounts of adhesive and activator. Apply the mixed adhesive to one surface. Assemble components carefully and clamp if required. Take care not to over-tighten – you need to leave some adhesive between the joint. Remove any excess adhesive at this point, before the structural glue starts to cure. Use a suitable cleaner such as NovaBond Surface Cleaner. Allow the adhesive sufficient time to achieve handling strength (working time is 3-5 minutes depending on environmental conditions) before moving or unclamping. Full cure and ultimate bond strength will take 24 hours to achieve. 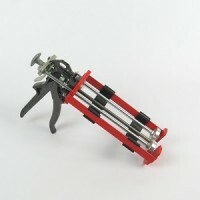 50 Signfix 11 is available in 50ml Nylon cartridges for use with a twin cartridge dispensing gun. NovaWeld SignFix 11 should be stored unopened in a cool dry location, out of direct sunlight. Stored correctly this grade can offer a 12 month shelf life from manufacture. NovaWeld SignFix 11 is a methyl methacrylate and should not be used without consulting the MSDS, which contains full information regarding the use of this product, including Transport, Disposal, Toxicological, Exposure Controls, Accidental Release and First Aid measures essential to the safe use of this product. Please contact us at enquiries@innovasolutions.co.uk for further information or to discuss your application.